Based on the life of legendary Finnish singer and songwriter Juice Leskinen. Posteljooni: Post for Father Jacob! Where redemption happens in the most unlikely places. This superlative film from Finland shows, better than most, how to tell a story with few words. The director, Klaus Haro, definitely shows the same skill with visual story-telling as that consummate master, Nuri Bilge Ceylan, famous most recently for Once Upon a Time in Anatolia (2011). The plot is simple: a youngish woman, Leila (Kaarina Hazard) is released from a life sentence in prison to take up a job as a personal assistant to a blind priest, Pastor Jacob (Heikki Nousiainen) out in the boondocks. Leila settles in, reading the pastor's letters from supplicants and writing necessary replies. Leila is not happy though; she resists Jacob's attempts at friendship; she avoids helping in other matters; she remains aloof, uncaring, unsatisfied. 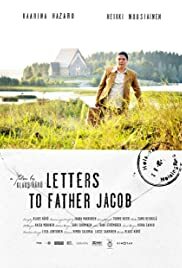 Until, one day, she notices that the postman fails to bring more letters for Jacob, and Leila discovers that things are never quite what they seem to be. The underlying story is complex, lyrical, philosophical, and ultimately heart-warming without being sentimental. The acting is simply perfect for the context: Kaarina Hazard, with a large bone structure, deep frowning face and brusque manner is every bit the ex-con and depressive personality – but why was she serving a life sentence? Why was she released? And why was she sent to the pastor, of all places? As the pastor, Heikki Nousiainen, is equally adept at portraying a gentle sage near life's end, supremely faithful to his god, forever upbeat and friendly, always with a gentle word for all, even for those who despise him, as Leila seems to do, at first. Dialog is sparse. Often, all that is needed is a quick look, a glance, a sigh, a slight groan of disquiet, as the two get to know each other and while the days meld into a seamless, almost timeless stasis with the gorgeous Finnish forests. Some comic relief is provided by the wary attitude of the postman towards Leila, as he brings the letters for Pastor Jacob. It's a credit to the script writer and director that I was never squirming in my seat eager for something to happen. In fact, that never impinged upon my involvement with the unfolding story: so that's perfect pacing for me. My only criticism, though, is that story lacks true believability: it's possible, yes, but highly improbable in real life. No story is ever perfect, however. This one, though, comes close by promising nothing up front; and then, with a denouement that arrives like a meteor, it rips away any comfortable sang-froid to show us that, if you're prepared to dig deep within, you will indeed find promises to keep. Highly recommended for all adults, young and old. Eight out of ten for this effort, no question.